Now this is interesting. Here I am in Denver, looking at my two loaves of Olive Oil Bread, one baked in Chicago as a control loaf, and the other just pulled from the charmingly windowless oven here in my sister’s kitchen. No adjustments have been made to the recipe, as I wanted to see what exactly would go wrong when baking at altitude. I’ve heard the usual horror stories of how beloved and sea-level-tested foods transform when baked on mountain tops. They deflate completely after baking, burn black on the outside and stay half-raw in the middle, stick to pans beyond all hope, and everything in between. I was prepared for just about anything, and warned my family that this would probably not be edible in the slightest. I steeled myself for the moment when I would certainly know my efforts had all been in vain. 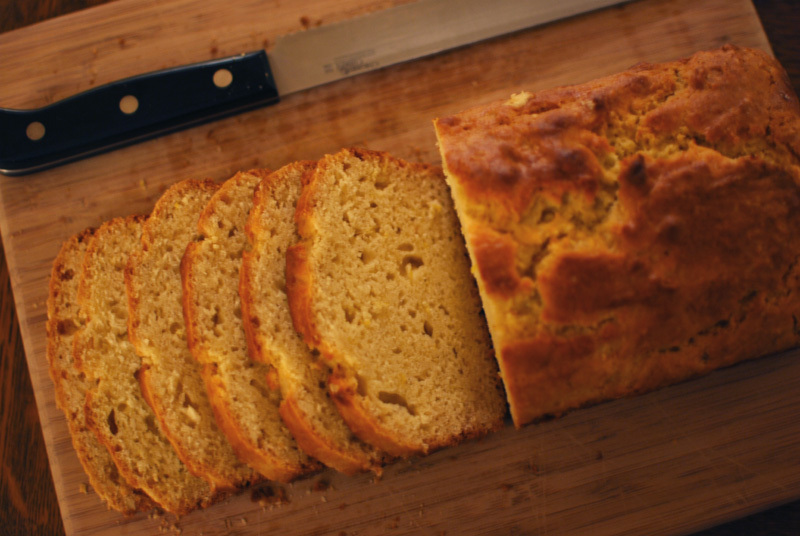 The high-altitude version of this bread turned out better than the control version. Yes, this version, which I assumed would remain doughy in the center, slightly burnt on top, over-risen and sinking in the middle… it came out better. Where the original was rich, a bit dense, and redolent with the flavor of olive oil, this high-altitude version was fluffy, lightly crumbly, and was flavored more with lemon, leaving the green fruit of olive oil to provide instead a tasteful and elegant backdrop. This was not what I was expecting. It’s best now to explain a little of the science behind high-altitude baking. For quick breads, the most important thing here is air pressure. Since air pressure is lower at higher altitudes, leavening happens more quickly. Note that it’s not more active, but faster. This means that all your chemical leaveners (i.e., baking powder and soda) give up the ghost in one mighty blow, and are done for afterwards. In order to trap the gases given off by these leaveners, you need to set the structure of your breads faster than at sea level. This means you need more flour (to provide a gluten structure), and higher temperatures to set it in place faster. Sugar is often reduced as well, to help with a more stable structure. In turn, more flour means a drier product, and higher temperatures mean the outside will cook faster than at low altitudes, and the cooking time will be less. To combat these two issues, it’s customary to add more liquid, especially an acidic one such as buttermilk or yogurt, as an acidic batter gives a better rise (long, technical story short). Additionally, higher moisture content will help carry flavors that may become muted, due to lack of water molecules (resulting from faster evaporation) that carry scents to the nose. That’s all well and good; but why did my high-altitude bread turn out better? In the original recipe, I had replaced the sugar with a lesser amount of honey, which is an acidic liquid. Yes, Gentle Reader, I had inadvertently perfected the recipe for high altitudes without even intending to, and didn’t even realize it. Silly me. Because of the increased moisture, my Chicago-made loaf was denser than it would have otherwise been; but this made for an ideal recipe at Denver’s altitude. Also, the lack of baking soda – which neutralizes acidity – in the recipe only helped matters at the higher altitude. As it turned out, this bread that I thought a bit uninteresting at home ended up rather soignée when baked at a mile high. The flavor of olive oil, so showy in the original, calmed down and let the brightness of lemon shine instead. (This also may have resulted from the required use of my sister’s standard-issue zester, which produces larger pieces of lemon zest, as opposed to my own Microplane which issues forth a mountain of diaphanous zest-bunnies.) The texture was much lighter and more airy, which was better suited to the nature of the bread; the original was rather pound-cakey in comparison. And so, my original experiment – wherein I bake a control loaf at sea level, bake a second loaf at high altitude to see what goes wrong, then bake a third loaf at high altitude with necessary adjustments made – is now thrown completely off track. I simply did not plan for the possibility of a better result at a higher altitude. There’s nothing to do now except go back down to sea level and adjust the recipe to fit that; I’ll be posting that variation on Friday. I’m re-posting this recipe as it was originally written, but have changed the name to reflect the best method of baking it. Stay tuned for more high-altitude adventures! 2. In a large mixing bowl, whisk together the honey, eggs, milk, and olive oil. Add the flour mixture, stirring until just combined, being careful not to overmix. Transfer the batter into the prepared loaf pan, and smooth the top. 3. Bake at 350° F for 50 to 60 minutes, or until a skewer inserted in the center comes out clean. Allow to cool in the pan for about 5 minutes before removing to a wire rack to cool fully before slicing. Serve slightly warm or reheated. 1. This bread will keep, wrapped in plastic, at room temperature for 1 to 2 days; alternatively, it will freeze beautifully wrapped well in plastic and aluminum foil. 2. For extra non-stick protection, line the bottom of the floured loaf pan with a piece of greased parchment paper. 3. This bread is best baked at around 5,280 feet above sea level.